5 Bedroom Detached House For Sale in Altrincham for Asking Price £750,000. 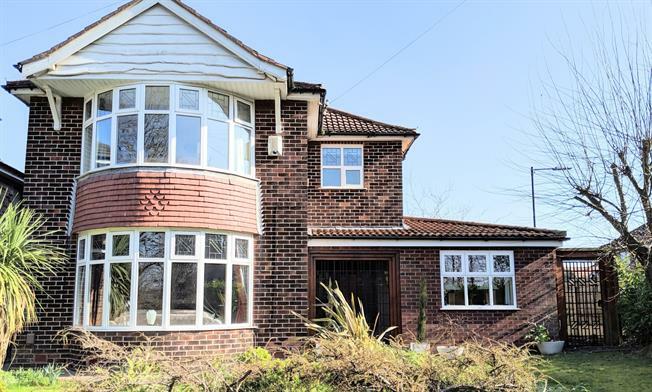 FEATURED IN THE BIG OPEN HOUSE 27TH APRIL This amazing property is taking part in the largest open house weekend in the UK!A superb five bedroom detached property in a highly sought after location and presented to a high standard by the current house proud owners. In "move in" condition, the property briefly comprises: spacious entrance hall, large lounge with bay window, dining room, family room, kitchen, utility and to the first floor, the family bathroom and five bedrooms one with en suite. In addition, Bedroom Two has staircase access to a cleverly designed open plan, light and airy loft space of over 200sq ft providing a versatile work/leisure space. The family room has bi fold doors which lead out to the patio area and fantastic lawned garden creating the perfect place to entertain family and friends. There are two single garages with parking spaces to the front of both, and fabulous potential to develop (stpp) with the installation of drains, water and electricity. This fabulous five bedroom detached property is offered with no onward vendor chain.